The youngsters came through to win a game that was all but lost. The Nationals fell behind 6-to-1 and chipped away to get the score to 6-to-5 in the 9th inning. 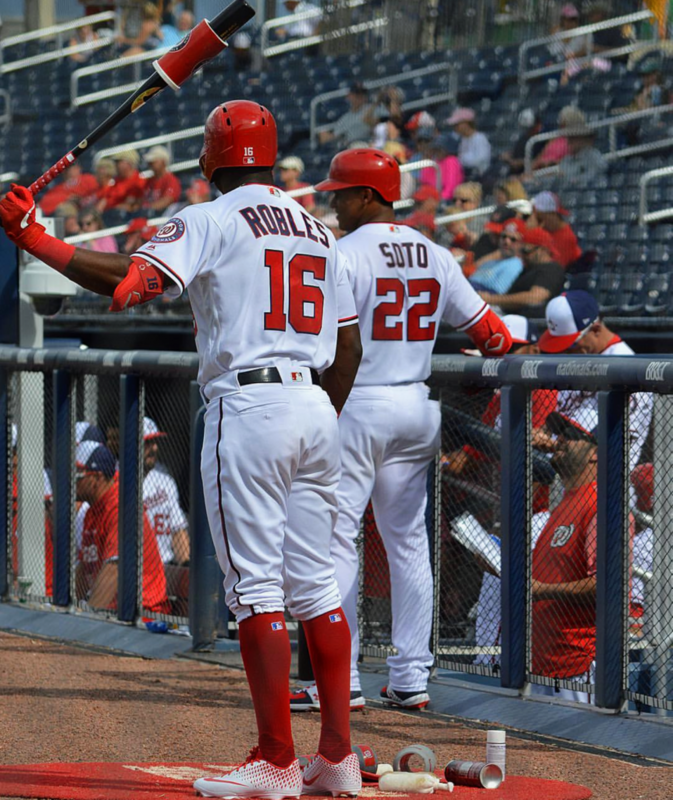 It was up to the rookie, Victor Robles, in a 2 strike count with 2 outs, and Robles smashed a home run to tie the game. Manager Dave Martinez brought in his closer in this tie game to hold the game and give the Nats a chance in the top of the 10th inning and that is what happened. Juan Soto crushed a 3-run home run over rightfield foul pole for the game winner. There was a philosophy in Spring Training to play hard to the last out, and this team has taken that to heart as 60% of their wins have been determined in the last inning which has included two walk-off wins and tonight’s win. The Nats starter Stephen Strasburg just lost all control in the 3rd inning of the game and was pulled in the 4th inning as he exited with a 6-to-1 deficit. The Nats were flat and looked demoralized, but when Joe Ross came in and threw zeroes the offense responded with a 2-run home run after a Phillies error to cut the deficit to 6-to-4. Howie Kendrick then hit the first pinch-hit home run of his career to make it a one run game which gave the Nats one swing to tie the game and that is exactly what Victor Robles did. Throughout the game, the Nats were hitting into bad luck and then the luck turned. In the bottom of the 9th inning with a chance to walk-off with a single, J.T. Realmuto smoked a liner that went right to Juan Soto for the last out in the 9th inning. The Phillies only big hit was off the bat of Bryce Harper when he smoked a 3-run home run as Strasburg threw three consecutive changeups in the same location in the outer third of the plate near the bottom of the zone. Harper missed the pitch twice but did not miss it a third time. It seemed he was given a signal from Aaron Nola who twisted his helmet as he was on second base. Besides that, Harper went hitless the rest of the night which included a big strikeout in the 9th inning as Sean Doolitte challenged him and got him. Speaking of Doolittle, the bullpen threw 6 scoreless innings between Joe Ross, “Everday” Matt Grace, and Kyle Barraclough. They did a fantastic job, and that is what the team expected when they were assembled. Again, credit to Dave Martinez for going to his “best” with the game on the line in the 9th inning with Doolittle. What a game, and the Nats move back to .500 with a series win in sight tomorrow with Jeremy Hellickson on the mound.